Ron, a partner with The Hollander Group at Hilliard Lyons, has been counseling high net worth individuals and families, not-for-profits, and corporate clients since 1984. Ron's primary responsibility is to track financial markets and economic conditions, research financial strategies and to provide insight on portfolio construction. Ron is a Registered Investment Advisor Representative and completed the Securities Industry Institute® course of study at the Wharton School at the University of Pennsylvania in 1991. 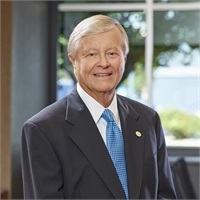 He has held leadership roles with many groups and organizations in the Greater Evansville area over his 50+ year working career. Ron received his Bachelor of Science Degree with majors in both accounting and computer science from the University of Evansville. He joined Hilliard Lyons following a successful finance and management career in the utilities industry.